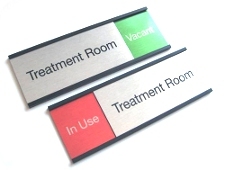 Signage is one way to help control access to the room whilst treatments are in progress. The aim of the sign in this context is to deter anyone from attempting to enter. Examples of warning signs are given below. These can be printed off and laminated. Alternatively, for a more professional finish, a local print-shop will be able to print onto a more sturdy material. 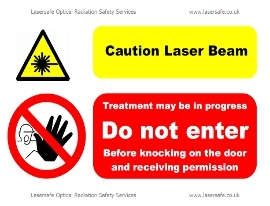 Treatment rooms are only hazardous whilst laser treatments are underway, so ideally signs should only be displayed when the room is in use. 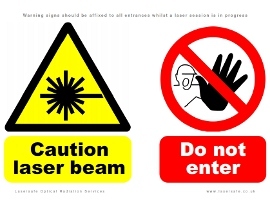 However, for rooms where the machines are more or less in constant use, it might be appropriate to use signs stating that the laser may be in use. Some examples are given below. 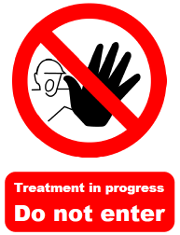 Signs do have limitations, for example, they will not physically stop someone entering a room. Also, not everyone will recognise the yellow symbols, or even read English. Ideally, signs should be displayed at eye level. 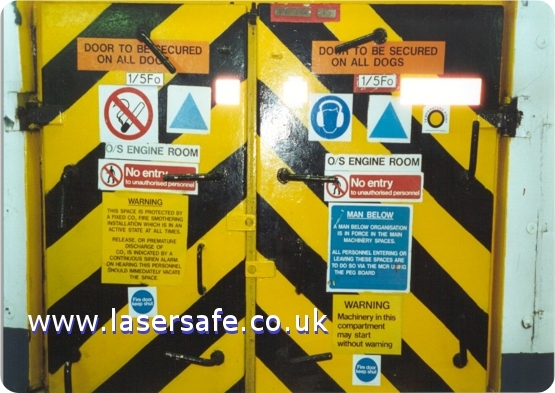 In the examples below, signs consist firstly of a yellow 'warning' pictogram and a red 'prohibition' pictogram. 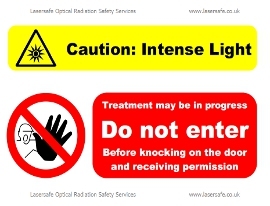 In situations where illuminated signs are used and are placed to the side or high above the door, a supplementary sign at eye level may be useful. Click on the images to display full-size. Temporary signs - display only when the room is in use. (b) identified by means of the appropriate signs as specified in the Health and Safety (Signs and Signals) Regulations 1996 (see below). 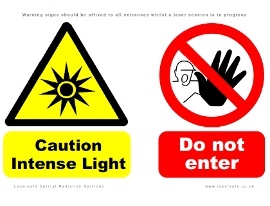 - Comprehensible and relevant information on the measures to be taken in connection with safety signs is provided to employees. 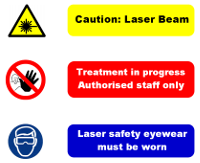 - Employees receive suitable and sufficient instruction and training in the meaning of safety signs and the measures to be taken in connection with safety signs. - The effectiveness of a sign must not be adversely affected by placing of too many signs too close together.